Gluten free, high in calcium and an antioxidant – what more do you need in a great breakfast? Barnyard millet, known as kuthiraivali in Tamil, oodalu in Kannada, odalu in Telugu, jhangora in Hindi and kavadapullu in Malayalam is a healthy millet which has six times high fibre content when compared with wheat. It’s a gluten free millet with high calcium, phosporous and fibre. It acts as a good antioxidant too. This puli upma with kuthiravali is an easy and tasty breakfast or dinner recipe, which can be made under 20 minutes. It’s a flavourful one pot meal. We usually make this puli upma with rice or broken rice/Noi arisi. I just tried it with kuthiraivali for a change and it was delicious when drizzled with few drops of gingely oil.The best side dish for this puli upma is finely chopped sambar onions/pearl onions. 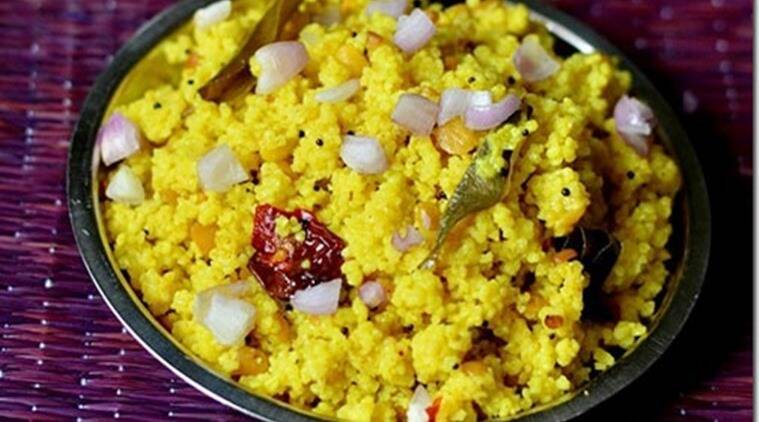 This upma can be made in an electric rice cooker too, but just add 1/2 cup of water more than the quantity you would use for a regular cooker. *Soak the tamarind in warm water for 10 minutes, using 2 cups of water for the extract. To this tamarind juice, add curry leaves, turmeric powder, salt and hing.Set aside. *In a kadai,heat a tsp of oil and roast the toor dal. Set aside the dal on a plate to cool. In the same kadai, roast the millet/kuthiravali till it changes and turns white and fluffs up. Set aside. *Heat oil in a pressure cooker and temper all the ingredients given above in the same order. The mustard seeds first, followed by urad dal and then the red chillies followed by a few curry leaves and finally asafoetida. Once the tempering is done, add the tamarind extract. When the water comes to boil, lower the flame and add the roasted dal & millet. Mix well, ensuring that there are no lumps. Add the remaining 1 cup of water. *Pressure cook on a low flame, timed to one whistle or three-four whistles if cooked on a high flame. It takes 10-12 minutes to cook. After the steam is released, open the lid and fluff it with a fork. It will look mushy when it is hot, but it becomes grainy as it cools down. *Don’t forget to add a tsp of gingely oil while serving.